The United States Constitution was signed on September 17, 1787 by 39 delegates to the Constitutional Convention – the Founding Fathers. The delegates represented 12 of the original 13 colonies, with Rhode Island not participating. 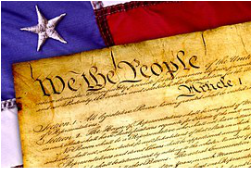 In partnership with the Foundation for Lee County Public Schools, a Constitution Essay Contest for 7th Grade students is offered as part of the Social Studies and Language Arts curricula of Lee County, FL. The program kicks off yearly on Constitution Day, September 17th.​.